2006 KZ RV Durango Used RV Durango 325BH - RV Dealer in Alabama, Used RV - Bunkhouse triple slide fifth wheel. Used RV 2006 Durango 325BH Used RV - Bunkhouse fifth wheel Take a look at this extremely well kept 2006 Used RV bunkhouse fifth wheel with an extra 1/2 bath. This camper is truly made for the family. Comfortable sleeping for 9 this triple slide KZ Durango 325BH is perfect for tailgating , trips to the lakes, or a trip across country. 2006 Durango 325BH Used RV fifth wheel Opelika RV Center KZ RV Spree 300RLS. RV Dealer in Alabama since 2000. Full line KZ RV Dealer Travel Trailers, Fifth Wheels, and Toy haulers. Large RV parts and service center to provide you service after the sale. The only lifetime Warranty RV dealer Serving the areas of Alexander city, Alabama - Montgomery, Alabama - Auburn, Alabama . 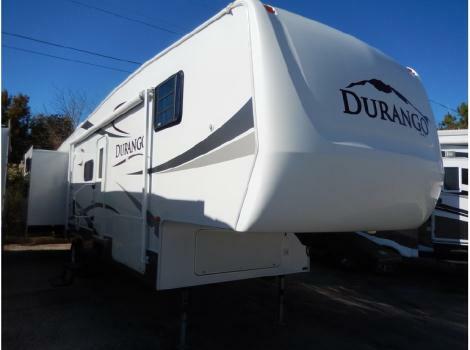 2010 KZ Durango 1500 D305BH, 5th wheel, bunk house in great condition. Base price for this model was $36,245 new. NADA is $23-27K as of April 2017. This great model sleeps 8-10, has tons of storage and a large u-shaped dinette that can seat 6. 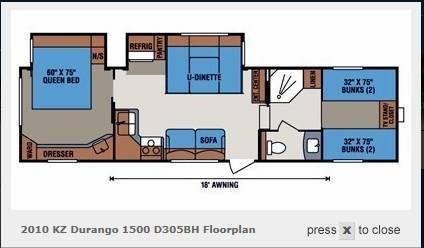 Two slides really open up the floor plan and its only GVWR 9,800#!Enjoy lots of storage above and below roomy U shaped dinette as well as above couch and stove/sink area. TV and stereo hookups with additional cabinets above and below in main living area. Kitchen has double sink, 3 burner stove, oven, microwave, pantry and refrigerator that runs on power or propane. Great kids area up front (opposite end of master bedroom) with 4 bunks, each with its own window and reading light, storage cabinet, tv hookups and sliding pocket door between the bunk area, bathroom and main living area. Room to sleep, store toys, watch tv and play.Master bedroom has a new queen short mattress, built in night stand with storage, reading lights, storage cabinets above the headboard and large storage wall with upper and lower cabinets, mirrored wardrobe closet and an additional sink. This bedroom also has a sliding door to maximize space and comes with 3 windows and tv hookups. Bathroom area includes shower with skylight, separate toilet and sink in its own room and also includes an outdoor shower.Lots of storage outside too in the multiple cubbies.Sleeps 10 (short queen, 4 twin XL bunks, dinette full/queen and scissor couch)Rear bedroom4 bunks in frontUVW 7,610#Dry Hitch Wt. 1,240#GVWR 9,800#Length 34'1"Exterior height 141.5"Exterior width 96"2 slides, bedroom and kitchen/dining18" automatic, adjustable awning, with auto retract (upgraded after purchase - over $1,300)Refrigerator 6 cu ftWater heater capacity 6 gallons w/ DSIFresh water capacity 55 gallonsWaste water capacity 32 gallonsGray water capacity 32 gallonsLP gas capacity 60#Furnace BTUs 30,000 (central/ducted)Air conditioner BTUs 13,500 (central/ducted)Tire size 15"U-shaped dinette seats 6+Outside speakersOutside showerSkylight over showerPower jacksLCD televisions (3)AM/FM/CD/DVD player with surround soundNew toiletNew $650 mattressPLEASE DO NOT CONTACT ME WITH CONSIGNMENT OFFERS.